Click on the photographs to view a larger version. 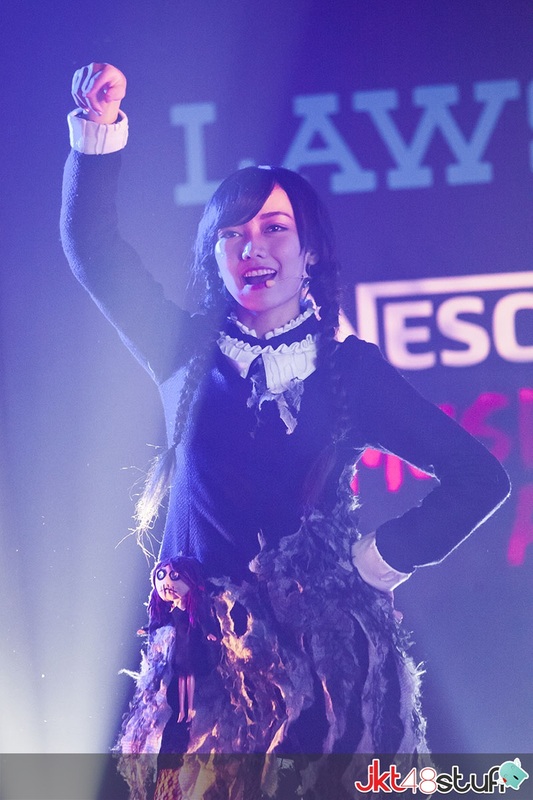 Returning to the center position following her election in the 10th single, Jessica Veranda takes the role of a fallen angel. Note the black halo above her head, which is a nice addition to make the costume complete. 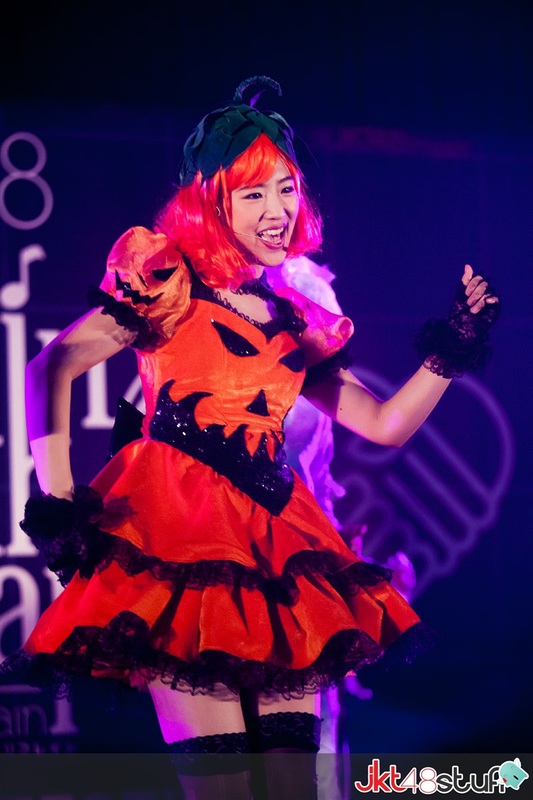 Haruka Nakagawa transforms into Jack O’ Lantern (or should we say Jill O’ Lantern). Wearing the pumpkin’s stem as a hat is a nice touch to the costume as well. 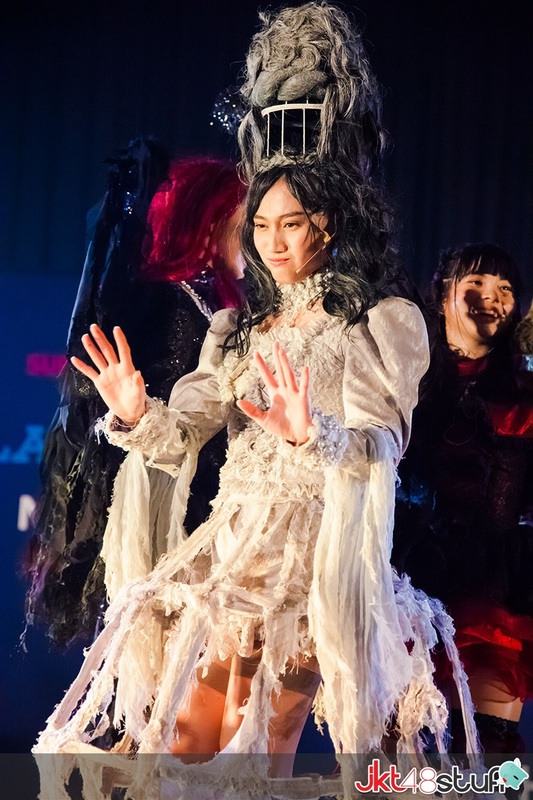 It’s not quite clear what Melody’s costume is supposed to be, but some fans speculate that she is a banshee, a female spirit from Irish mythology said to be the harbinger of death. 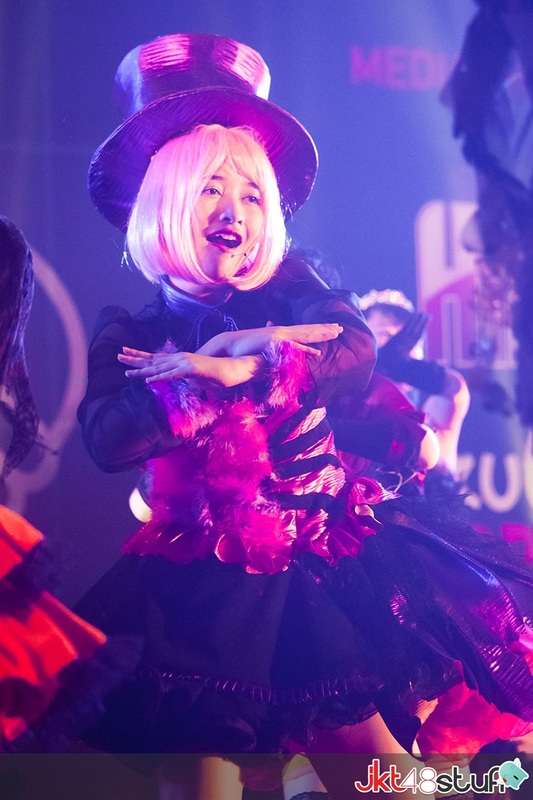 The popular theory among fans is that Shania’s costume is that of a succubus, a female demon who seduces men. It’s also possible that she is playing the role of Lady Dracula. 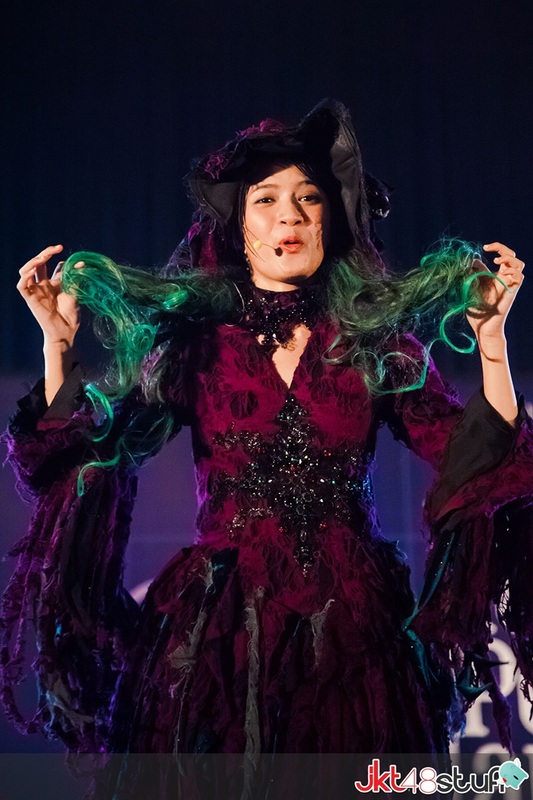 The Mad Hatter from Alice’s Adventures in Wonderland is an iconic character, and Kinal plays this role very well as someone with a wacky personality. Sisil’s is a unique costume based on the Malay and Indonesian folklore of the pocong. Pocong are said to be souls of the dead trapped in their burial shrouds, commonly used in Muslim burials. There are many rabbit characters in folklore and fairy tales, but Nabilah most likely portrays the White Rabbit, also from Lewis Carroll’s Alice’s Adventures in Wonderland. However, I can also see her as the Killer Rabbit of Caerbannog from Monty Python and the Holy Grail. Viny is likely supposed to be a witch, but where is her broom? The Little Red Riding Hood is commonly depicted as a naive young girl. No one can portray this role better than Cindy Yuvia with her innocent smile. 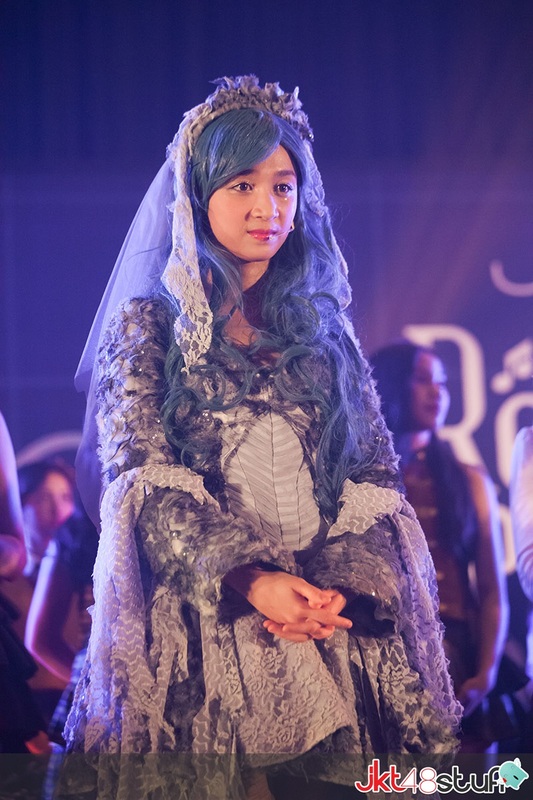 There is some ambiguity to Ayana’s costume, but the veil on her head appears to indicate she is the Corpse Bride from director Tim Burton’s 2005 animated film. Fans of American film culture will be familiar with Ghaida’s striped costume as that of Beetlejuice. The oversized hat is also a great addition to make the costume original. Marionette operas were popularized in 18th and 19th century Europe, and Michelle’s costume with her silver hair is clearly inspired from that time period. In another nod to American film culture, Beby’s costume is likely that of the Bride of Frankenstein. However, he mummy-like bandages and elaborate hair might also be inspired from the Egyptian queen Nefertiti. Pay close attention to Elaine’s costume, and you will notice the winding key on her back. This is a clear indication that hers is meant to be a wind-up doll. Perhaps a more obscure reference to American pop culture, Yona likely portrays Wednesday Addams from The Addams Family. 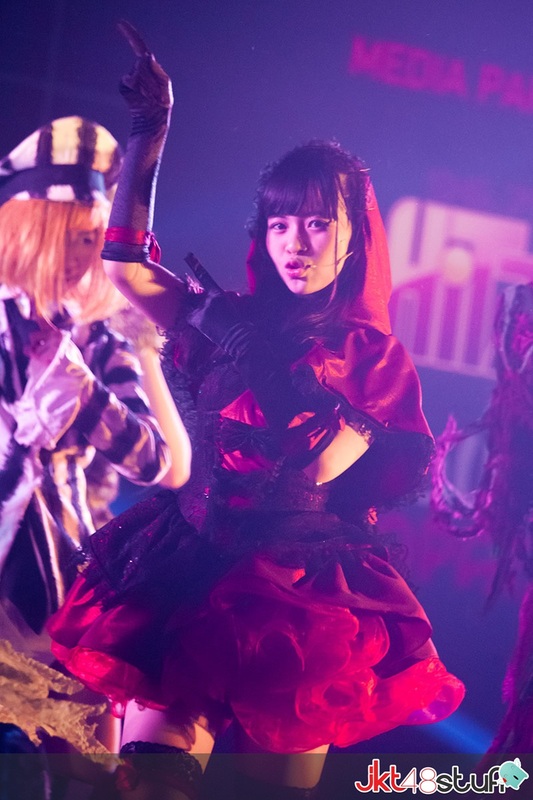 Although Lidya’s costume is simple, it’s quite straightforward as a werewolf. Have you ever seen a cuter werewolf than this one? While we expect this line-up to be the final senbatsu for “Halloween Night”, JKT48 management can always make changes at the last minute. If you have other theories on some of the costumes above, let us know in the comments below! Photography by Pitra. Banner image courtesy of Imajineshon. Japanese translation by Wotaliano, Japanese QC by Japarta. Richardson H. Kilis is a U.S.-educated Indonesianist who studies the relationship of technology and cultural exchange. is she gonna revive me? 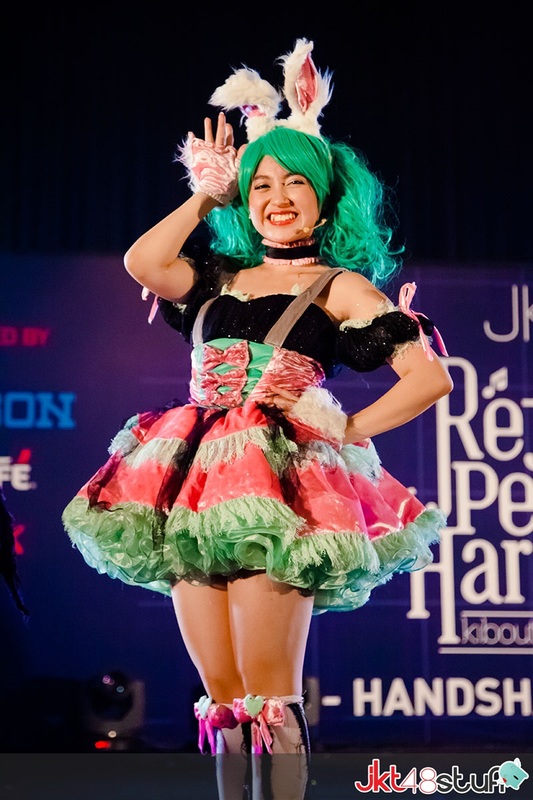 Kinal has a pink tail?? To me, Melody is a Victorian ghost rather than a banshee..
i just begin to bring that subreddit to be active again and it still has a, well, not so many redditor to subscribe to that subreddit. Also i think it would be great, to provide a various platform for fans to talking about JKT48 in English. Personally i think there isn’t too much “forum” in English to talking about JKT48, of course besides jkt48stuff and stage48. My personal goal is to get as many as people to know JKT48, especially for English speaking people. Considering from now and then i think JKT48 will always releasing single with English version and it would be a waste if it’s not getting a proper attention to it. Anyway, reddit was and still banned in Indonesia by several ISP, you might want to use Proxy or VPN to accesses reddit. 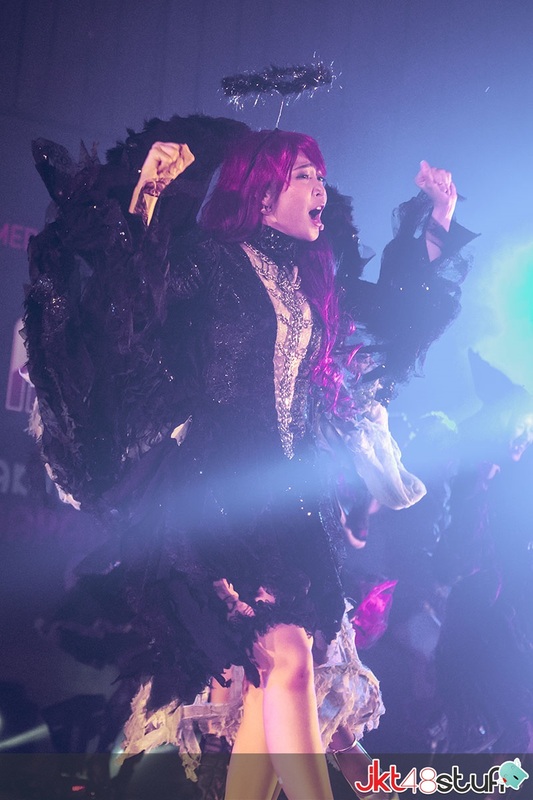 I heard that Melody is wearing Victorian Ghost costumes.. And Veranda is wearing dark angel costumes.. Nice costumes :).. Especially for michelle..